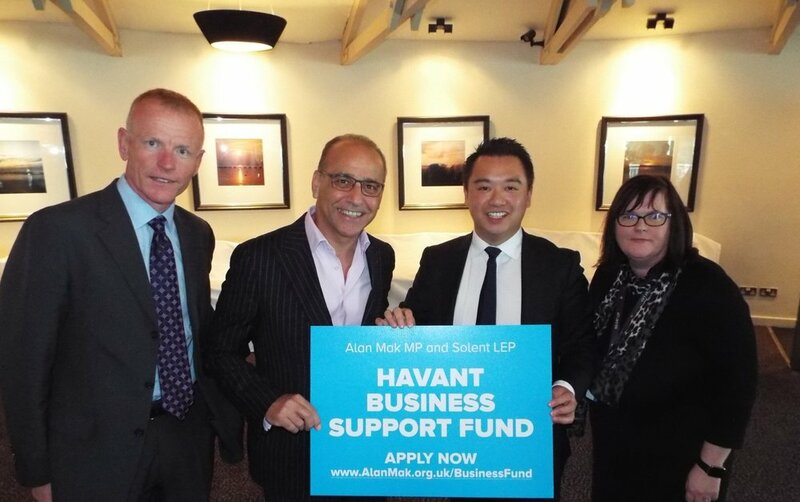 Theo has joined forces with the local Alan Mak MP to relaunch the Havant Business Support Fund for its second year. The £100,000 fund was started by Havant MP Alan Mak with backing from the Solent Local Enterprise Partnership (LEP) and funding from central Government. Designed to support budding entrepreneurs looking to start a business. It also supports existing business owners from across Havant, looking to grow by developing new products or services, and has proved a hit in its first year. Supporting a number of local firms it has resulted in almost half a million pounds worth of investment into the local economy. In total, the investment is forecast to secure 24 jobs at the three firms awarded funding so far. The money has been used to invest in new equipment such as machinery, with the new funding resulting in an additional investment of over £360,000 into supported projects. During a visit to Langstone Hotel on Hayling Island to meet with local business owners, Theo praised the Fund and encouraged other local residents to apply for funding to help them start or grow a business. One of the businesses that has benefitted from the funding is New Lane-based manufacturer Straightpoint. A world leading exporter of industrial weighing equipment, Straightpoint has used the money to expand its site and purchase machinery which allows it to manufacture its products from start to finish. Businesses can apply for between £10,000 and £75,000 from the fund to contribute towards projects that will unlock additional investment, improve business productivity and support local jobs.